Bible Cartoons: Solar eclipse & self-doubt! I’ve just watched in wonder the partial eclipse of the sun which was visible across much of the UK. I projected the event onto a sheet of card using binoculars & a tripod & took lots of photo’s. many were blurred – that teach me to have an auto-focus camera! Still, many have come out OK. I spotted a sunspot (pun intended!) 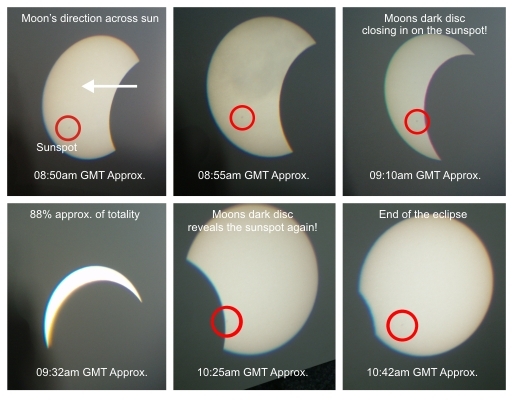 in the lower left quadrant of the sun’s disk & watched as the moon gradually caught up with it & obscured it. The light levels dipped quite a bit, took some photo’s of that too, although it just looks a bit like dusk! All the birds started chirping – probably thought it was time for bed! Then I started to watch for the reappearance of the sunspot I had seen earlier. I waited… & waited. No sunspot. Then I started to think I had imagined it. After a long time, it did finally reappear. I was rather relieved. This may not sound like much, but it tells me that I really do doubt myself sometimes. I am really grad that there WAS a sunspot, but I was quite ready to believe that I had been mistaken. Not good! Of course, the eclipse isn’t about me! Most of the time I was in wonder of our mighty God who thought of an eclipse! He set the sun & moon’s diameters & distances at just the right amount, so that the moon’s apparent diameter is the same as the sun’s – just so we can have total solar eclipses! Now that is awesome! I give thanks to our heavenly Father for his wonderful creativity. Anyway, I watched as the moon moved across the sun’s disk, & finally the partial eclipse was over.